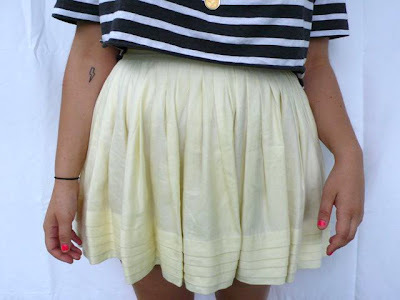 urban tee turned perfect croptop, twenty8twelve heavy linen miniskirt (it rules), chipped neon nails, lucky coin necklace, permawrist hairtie (trying to break this habit), bolt tat. not pictured: destroyed white brogues, self-trimmed bangs. I dig that skirt...need to make one mine. I have cut and coloured my own hair. When I next go to a hairdresser they're going to have a little meltdown trying to deal with two shades of blonde, a layer of ginger after I picked up the wrong box and a badly-executed Spock fringe. You are lookin' gooooood, Elizabeth! gah, i have the same problem of always keeping the hairband on my wrist and then when it turns up in photos it always looks so goofy. mannnn, i totally have one on my wrist RIGHT NOW. glad you like the pic. I'm glad I'm not the only one with the perma wrist hairtie in summer. Sixth grade will never lose its influence. when did you get that tattoo? !